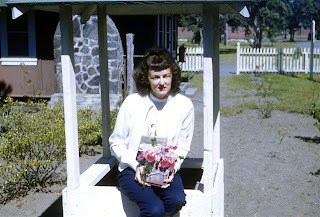 seattlefrank: My Mom and Dad's Honeymoon Cottage? BIG ISLAND VACATION, PART ONE: So we've settled in for a three night stay here in greater Volcano Village, a small town just outside the entrance to Volcanoes National Park. Elevation here is 4000 feet and it's been heavily misting off and on since we got here last night. Spent most of today exploring the easily accessible areas of the massive park, including visits to numerous steam vents and lava tubes, the Visitor Center and a run down to the ocean. A highlight (for me at least) was a visit to Kilauea Military Camp, which was set up almost 60 years ago as a rest camp for military personnel. The significance is that my Dad spent his honeymoon in one of the many cabins, all of which are still standing today. (Sidenote: Mom and Dad's honeymoon was in February, I was born in November of the same year. Could I have been conceived in this very cottage?) Through a little research and some help from Dad, I think we were able to locate the exact cabin in question (see photos, which upon close inspection show that the chimney stones are identical, though the cabin exterior has changed), which was very cool. The whole complex seems caught in a timewarp, with the original PX, theatre, bowling alley, chapel and cafeteria still in good condition and still being used on a regular basis. The big news on this side of the island is a new, and very powerful, vent that has opened nearby, that is emitting a great deal of sulphur dioxide, threatening an evacuation of the Village if the prevailing wind changes. The temperature at this elevation has been in the 50s and 60s, the house we're in is very comfortable with 3 bedrooms and 3 TVs and wireless Internet. The property is very lush, almost jungle-like with numerous birds (including the goose-like Nene, Hawaii's state bird) and other critters roaming about. There is still quite a bit of visible snow on the top of the volcanoes, which I'm told, is unusual for this late in the season. We'll be leaving for a 6 nite stay in a waterfront condo in Kona on Saturday. We'll go to the famous lava flows tomorrow. That's great. I remember Mom had the cottage key in her jewelry box. Too bad you didn't bring it with you, it probably still works. Hope you're having fun. You missed some snow yesterday.